“Fishing Boats” by contemporary Asian artist, Tran Quang Dinh is a stylized presentation of a theme very common in traditional Asian paintings. This composition shows fishing folk in traditional Vietnamese hats sitting and mending fishing nets beside two huge fishing boats anchored on the shore. 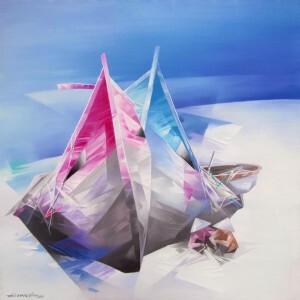 The use of angular shapes and unrealistic colors provide a modern perspective to the composition.